Im currently working on a web based monitoring system for a friend and came to a problem with the ability of regularly changing the WiFi settings. As the system would be permanently installed and just have a few buttons and no lcd and connection a serial terminal seem too difficult for my non technical friend. I decided to simply house a configuration txt file on a SD card and the system would read and load the settings on startup. Again i was able to do this in only a few lines of code and thought it was worth sharing. User simply modifies config file on Sd card and inserts and resets power. On power up my script will first flash the led three times (card & Indicating config file) and will then attempt loading the wifi settings . If connection is successful the led will light. At this point the sd card can be removed. If power was reset with no card (no led three flashes) it simply would not try to load the new wifi settings would just connected network stored in Esp8266 flash. You will still get green led on to indicate wifi connected. 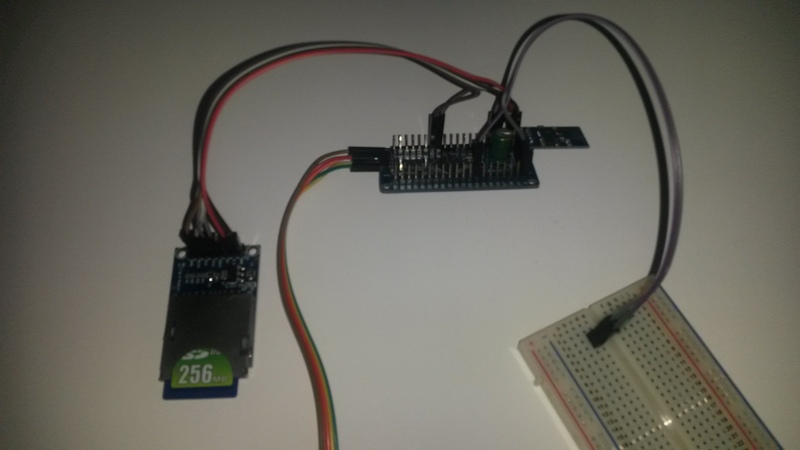 Connect the sd holder to ic2 bus. 1)Install bv508 firmware with SD card support. 2)Now re-Install esp8266 /dt11 rookie. //File structure , has to be as per this to work ! print "Error reading setting does file and SD card exist ?" if isIP() = 1 then // check wifi connection ! print "\nUnable to get IP address"